Carmen Moran Broz, 91, died calmly on the morning of September 17, 2015 in Santa Rosa, California. Carmen Broz was a powerful presence in the world because she lived her life to its fullest potential by being in service to others. She was fulfilled and at peace when she passed away having understood that “the process of dying begins at the moment of birth”. The memorial service for Carmen Broz will be held on Saturday, December 12, 2015 at the First Baptist Church of Palo Alto, 305 North California Ave., Palo Alto, CA 94301. The service will begin at 2:00pm and be followed by a reception with light refreshments. All friends and family are welcome to attend. In lieu of flowers, the family requests that you make a contribution totheEl Salvador Projects (http://www.pafmelsalvadorprojects.org) of the Palo Alto Friends Meeting (Quakers). Carmen founded the El Salvador Projects in the 1990s to raise the level of education for young people of the poorest communities in El Salvador. 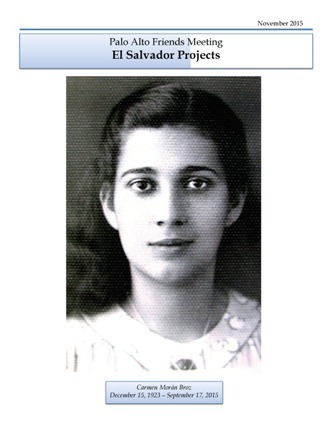 Continuing under the auspices of the Palo Alto Friends, the El Salvador Projects are Carmen’s chief legacy and her testament to the uplifting power of education. Carmen’s “moment of birth” occurred on December 15, 1923 in Sonsonate, El Salvador. Her mother, Carmen De Moran Paredes, died when Carmen was four years old. As a nine-year old, Carmen lived through the genocidal “La Matanza” that killed many thousands of indigenous Salvadorans. Her older sister Elizabeth insisted that their father, Juan Moran, enroll Carmen in a boarding school where she received a strong education from Catholic nuns. At age 20, she accompanied the family of a former teacher to San Francisco, California to care for the children. Carmen remained to earn a bachelor’s degree in economics from the University of California at Berkeley in 1951. In 2013, UC Berkeley recognized Carmen Broz for her extraordinary service and activism in Central America by electing her to the UC Berkeley Wall of Fame (http://berkeleywalloffame.org/service-activism/carmen-moran-broz). The road to this high achievement began many years earlier. Carmen married Perry James Broz in 1953 and raised four sons: Franz, Lawrence, James, and Robert. She became a reading specialist in the Millbrae Elementary School District, near San Francisco, and advanced the educational prospects of a great number of low-income and disadvantaged children. In the summer of 1986, six years before the 1992 peace accords settled the civil war in El Salvador, Carmen joined an international delegation sponsored by the SHARE Foundation (http://www.share-elsalvador.org) to accompany peasant families intent on reclaiming their agricultural lands in El Barío, a rural area of Suchitoto, after massacres and intense bombing by the military had made them refugees for years. With supplies loaded on buses and trucks, they camped overnight in the bombed-out town of Aguacayo, between Suchitoto and El Barío. While attending mass in the ruined church of Aguacayo the next morning, they were suddenly surrounded by soldiers of the Atlacatl Division, known for its massacres of campesinos (rural people). In this tense and dangerous situation, Carmen found it possible to move from fear and anger to recognition of common humanity with some of the soldiers. Carmen and the other internationals were jailed and expelled from El Salvador the next day, but remarkably, the campesinos were allowed to continue to El Barío. There they reestablished their agricultural pursuits and created the village that today is home to the El Barío School, built initially with funds from a grant that Carmen and Robert Broz wrote with the villagers, now educating some 500 students from El Barío and surrounding villages. Carmen retired from her teaching career in 1986. Banned from El Salvador as persona non grata until she acquired a new passport (without that forbidding imprint). Several years later, she worked with the SHARE Foundation in Nicaragua, teaching, reading, and helping communities develop clean water supplies. Returning to El Salvador in 1989, with the civil war at its peak of violent intensity, she worked to establish nursery schools with Montessori methods and good nutrition. After the Peace Accords were signed in 1992, her emphasis shifted to providing medical care to remote villages in northern Morazán. By the time a non-governmental organization launched a program to offer clinics in that region, Carmen had concluded that “education is the fastest way to end poverty.” Redirecting financial support that continued to flow from Palo Alto Friends and a small but growing number of kindred spirits elsewhere in the U.S., Carmen administered funds for school uniforms, shoes, and books to enable campesino children to attend school – a life-changing opportunity in rural zones where previously very few people had advanced beyond the second or third grade, and the majority of adults were functionally illiterate. As the children of rural families moved toward high school age and governmental funding for elementary education in rural areas began, the El Salvador Projects increasingly emphasized support for secondary education for promising students. Eventually, the first of those students graduated, and some came to Carmen to ask her what could come next. They wanted advanced education – and Carmen determined that she would help them gain it, knowing that when one person in even a large Salvadoran family is well educated and employed, it is very unlikely that anyone in that family will ever again be destitute. As Carmen approached her 80th birthday, she recognized that she no longer had the energy to travel across the country, maintain working relationships with people in numerous locations, and speak to American supporters to report on the work and raise funds.. Fortunately, her son Robert Broz had fallen in love with El Salvador when he came to visit her, and over a period of years he had become familiar with the villages and had increasingly assumed responsibility for work his mother could not easily do. The El Salvador Projects Committee was relieved and grateful when Robert agreed to assume the position of Field Director. Carmen’s entire life prepared her for this work. When she returned to the war-torn country of her origin, Carmen brought with her deep cultural knowledge, professional training as a teacher, and the strength of character and spiritual foundation of decades of Quaker faith and practice. Robert Broz continues this work with the personal qualities and training that are uniquely appropriate – cultural insight gained through years of residence in El Salvador, with a Salvadoran wife and children, and active engagement with both rural communities and the town of Suchitoto, a college degree in agriculture, and the experience of growing up with Quaker values and practices. The El Salvador Projects have been highly successful. As of 2013, more than one hundred young Salvadorans have been aided in their quest for higher education, including more than forty with two-year degrees in such practical areas as teaching, nursing, pharmacy, and other technical areas, and thirteen with four-year or higher degrees. The Projects currently support twenty one university students. The educational emphasis is supplemented by smaller programs to provide reading glasses and crafts training to seniors in rural areas, to help families acquire highly efficient, low-smoke wood-burning cooking stoves, and to promote access to education in other ways (such as an annual University Fair that acquaints prospective students with programs and financial support). On December 12, 2015, all of us who love and respect Carmen Broz will celebrate her life, wherever we are in the world. With Carmen, we all share the satisfaction that comes from knowing that so many people have benefited directly and indirectly from the El Salvador Projects that she launched in the midst of terror and conflict. The family wishes to express our deepest thanks to Carmen’s caregivers, Maria Rivas and her staff at MountainView Care Home, for their love and kindness, and to Maricela Oceguera, Carmen’s closest friend and companion during her final years. Maricela and Maria are like family and our hearts go out to you. The family also expresses our deepest gratitude to Hulda Muaka, Bill Bauriedel, Lynn Mitchell, and other members of the Arrangements Committee at the Palo Alto Friends Meeting for their heartfelt assistance in planning Carmen’s memorial service.